Today I have some nails done in collaboration with author Elisa Freilich! 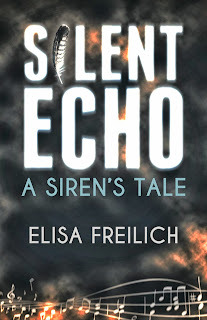 Elisa's new book Silent Echo: A Siren's Tale just recently released on ebook and will be available in print very soon. After reading through the book I came up with these pretties. 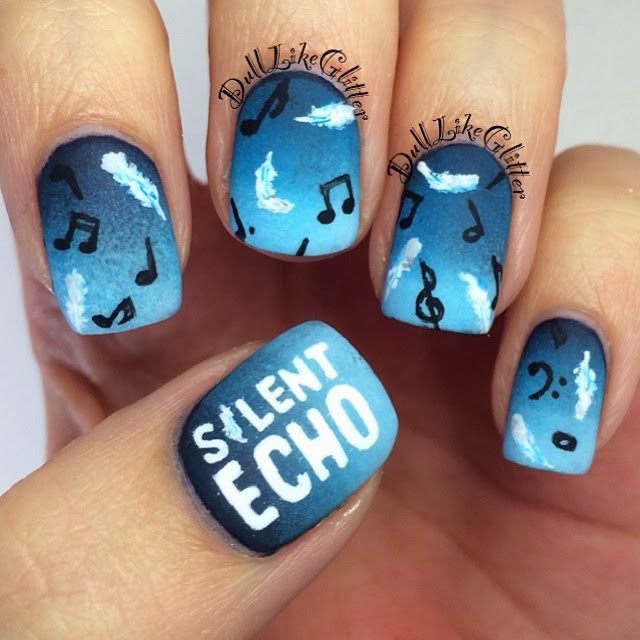 For these nails I did a blue gradient nails full of floating white feathers and music notes. The thumb nail is inspired by the text on the books cover art. Without giving too much away, there is a strong emphasis on singing and birds/wings throughout the book! This YA book fits right into the genre of Twilight and The Hunger Games. The story is about a mute teenage girl who's silence is mysteriously broken. Portia discovers that it isn't a normal voice that she has! To check out the novel for yourself you can buy it on ebook or a printed copy through Amazon or on iBook for you mac lovers. At only $4.99 for an ebook copy it's a great deal!